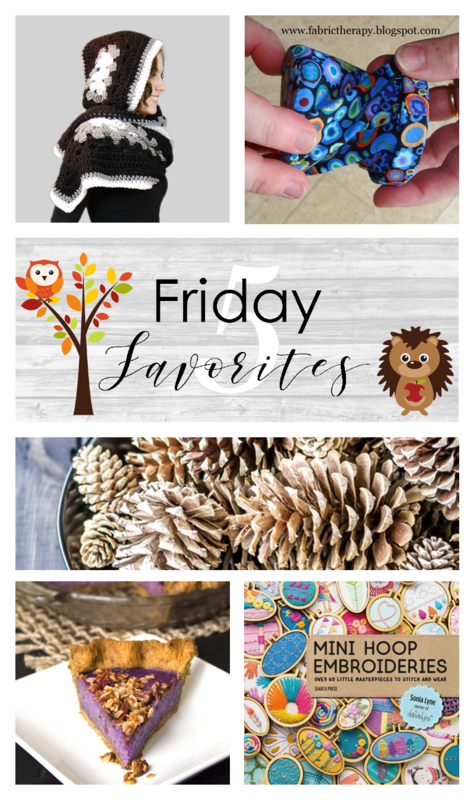 This is the last week for normal Friday Favorites until we get closer to Christmas, because it’s time to switch to something I like to call Festive Friday! It’s like a Friday Favorites expanded edition. There will be more links, and each week has a theme. We’ll start with Holiday Decor and Ornaments, followed by Gifts for Her, Gifts for Him, Gifts for Kids, and ending on December 14th with Last Minute Gifts. These are always a lot of fun for me, and I hope for you as well! This little thread catcher from Fabric Therapy is such a great idea. You can pop it open to use, then twist it closed to hold your bits of thread inside. This time of year, I feel like everything should have a hood and pockets. This crochet pattern from Stitch and Hustle is a must-have. I don’t know which I love more, that this pie from Wife Mama Foodie is purple, or that the crust is gingerbread! When I did my Hoop Art series last year, I made some jewelry from teeny, tiny hoops I found from Dandelyne. She just released a book, and based on her talent and bubbly personality, it has to be a fun and inspiring read. Gifts for people who sew - order by Nov. 27 for Christmas delivery!